Where exactly is the theatre? The theatre is just across the Mill Pond outside Dundrum Town Centre. We’re opposite McDonald’s and beside Milanos. Look for a pink sign and glass doors. Which bus route should I take? The 14, 14C, 44, 44B, 175 routes will take you directly to Dundrum Town Centre or Dundrum main street. What Luas stop do I get off at to get to the theatre? You can get to the theatre from Dundrum or Balally stops. If you get off at Dundrum stop then walk down the steps and turn left to walk up the main street. Walk past the church on your right and straight through the crossroads. 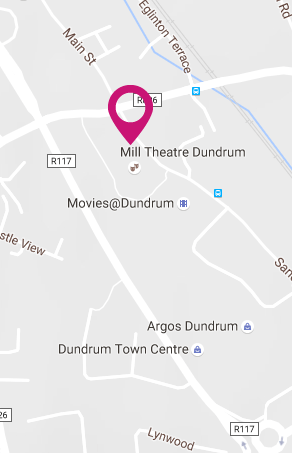 The theatre is just on the right before you get to Dundrum Town Centre. If you get off at Balally stop walk up the steps and then across the road towards the big RSA building. Follow the path around the apartments on your right and straight down the road past Dundrum Town Centre. The theatre is just on the left after the cinema and the Mill Pond. Where’s the best place to park if I have mobility issues? If you have a disabled parking permit there is street parking outside Ridgeford Apartments and in the public carpark across Sandyford Road from the Dundrum Town Centre complex. There are also dedicated spaces in all levels of the Dundrum Town Centre Carpark. The Green Carpark is nearest the theatre. Are there places we can eat nearby? Do any of them have special offers for a pre-theatre menu? There are many dining options to choose from in both Dundrum Town Centre and Dundrum main street. Cookes Restaurant and Bar offer a pre-theatre menu and are located beside Harvey Nichols. 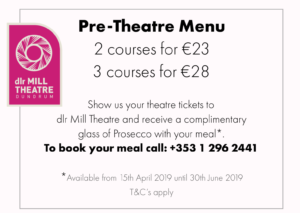 Check out the Pre-Theatre menu here! You can purchase tickets online, over the phone, or directly at the box office. Online and phone sales include a €1 booking charge. Can I use my Dundrum staff discount on tickets? If a show offers discounted tickets then we can offer a Dundrum staff discount. Not all performances will have this as it is at the discretion of the producer. Can I use a Dundrum Gift Card to purchase tickets? Yes, but you must go to the Box Office in person. Unfortunately we can’t process Dundrum Girt Cards over the phone or online. Can I return tickets/ get a refund? We do not offer refunds or exchanges. However, in case of a sold out show, we may be able to resell your tickets and refund your purchase. Contact the box office if you have any queries. What constitutes a student concession? Students must provide valid third-level identification to purchase a student ticket. Student tickets are not available for second-level students. Is there a concession rate for senior citizens? Concession rates may be available for seniors, students, and children when there are concession rates available. Many shows will have concession rates but this is at the discretion of the producer and may not always be the case. What does a Family Ticket include? If a family ticket is available to purchase then it will consist of two adults and two children unless otherwise stated. Can my tickets be posted? Your tickets may be posted to you at request. There will be an additional charge for postage. Yes! You can purchase gift vouchers from the box office or over the phone. Our vouchers never expire so keep them safe! Additional charges for postage may apply. Do babies get free tickets? Do babies need tickets? Everybody, no matter how small, needs a ticket so your baby will also need one. For many of our performances, these tickets are free for toddlers under 2, though this is at the discretion of the producer. For some shows, especially those aimed at very young children, there may be a charge. Please contact the box office if you have any concerns when you are booking. Doors to the auditorium and studio open fifteen minutes before the show. It’s important that you get to the theatre before this time so everyone is seated. Our box office and bar are open one hour before show time so you can purchase or collect your tickets, meet friends and enjoy a drink before the show. You can also order interval drinks at this time. 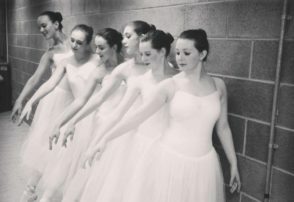 Depending on the nature of the performance, latecomers may be seated immediately or they may need to wait for the interval. Please ensure you arrive at least fifteen minutes before the performance to avoid disappointment. If you are required to wait you may do so at the bar. Yes, wheelchair seats are located at the back of the theatre near the doors. You may access the auditorium by taking the lift down to the ground level. Yes, the lift is available for use by all of our patrons and accesses all levels of the theatre. Do you have a bar? When is it open? The bar is open an hour before the show, throughout the performance, and afterwards. To avoid queuing for drinks during the interval you can order them before the show starts. Do you provide an interval drinks service? Yes. To avoid queuing during the interval and to avoid disappointment you can order your drinks from the bar before the show. Can I bring in outside food to consume in the theatre? Food or drink purchased outside the theatre is not permitted to be consumed on the premises. Hot drinks, even purchased from the bar, are not permitted inside the auditorium or the studio. No glass is allowed in the auditorium or the studio and must be exchanged for plastic cups. Does the theatre have free wifi? Yes the theatre has free wi-fi for all of our patrons. Please enquire at the box office or the bar for more information. Can e-cigarettes be used in the theatre? No kind of e-cigarettes, vapes, or recreational inhaler may be used on the premises under any circumstances. Is photography allowed in the theatre? No photography or recording device is permitted during performances. Phones must be completely switched off. Can I bring my child’s pushchair into the auditorium? Are there baby changing facilities in the theatre? No. The closest baby changing facilities are in Dundrum Town Centre. These are located near the public toilets on the ground floor, and beside the gadget shop on the mezzanine level.